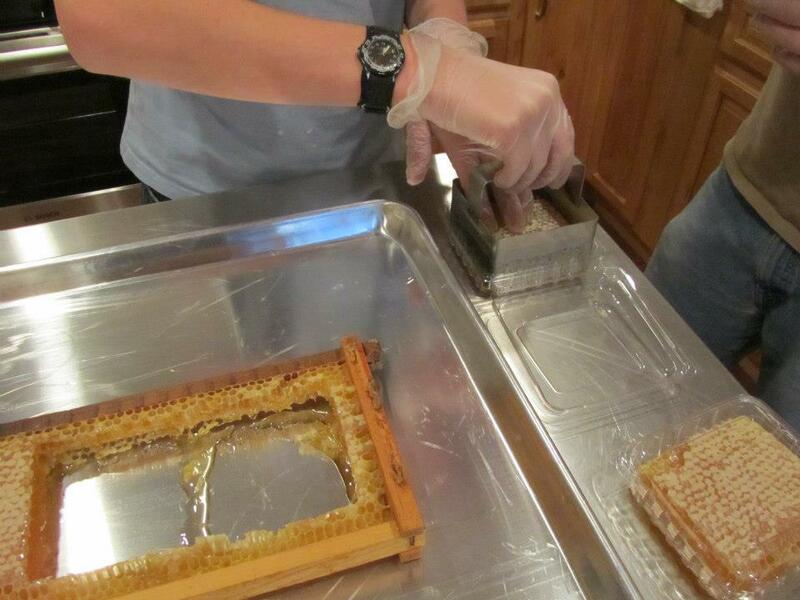 NORTH LOGAN–The beekeeping Huntzingers and their young family have been juggling “an out-of-control science experiment” for about five years now. As their reputation moves beyond the state lines of Utah and throughout the rest of the nation, it seems as though they are just getting started. “We’re just making up all this stuff as we go,” said owner and entomologist Craig Huntzinger. Nathan Huntzinger cutting comb honey for the family business. Photo by Jessica Sonderegger. California natives Craig and Kami Huntzinger remember their family-owned honey business began as nothing more than an idea for a family project. Kami explained there was a common interest in bees among her little family and because of that, an investment was made. Craig explained that their first year they–then a family of six–relied on second-hand equipment, managing to catch two swarms of bees. With the goal of fueling a small business far from mind, the Huntzingers produced about six gallons of honey that season. Their family project, now recognized as Bees Brothers, quickly developed into a successful establishment and local novelty—satisfying both a community and nationwide craving. Now sustaining about 14 hives, they estimate this year’s harvest at about 60 pounds of honey from each hive. Be it chunk honey, comb honey, honey caramels or honey-roasted almonds, Bees Brothers has spent the last five years specializing in honey products and are gaining a reputation to show for it. Recognizing their collaboration with Caputos as a gateway to their popularity, Craig and Kami both acknowledged the benefits of serving the Salt Lake audience—more traffic flow, more relationships built. Craig also mentioned their involvement with Bitcoin, an online trade system utilizing digital currency that has allowed their company to thrive inside and outside Utah. This past week alone, Bees Brothers had orders placed from Ohio, Vermont, Colorado and Kentucky. A hard working family with big ideas and a genuine love for honey. The Huntzingers provided Hard News Café with a tour of their beehives and their newly constructed Bees Brothers kitchen—the latest addition to their business plan; a conveniently designed space for the harvest, creation, production and packaging of all their honey-based and homemade products. With the conclusion of their honey harvest, the completion of their kitchen and a continuing increase in interest around the valley and the nation, Bees Brother is ongoing and stalwart with their pursuits. Bees Brothers has many recipes and products to come and is looking forward to involving the two youngest siblings, the Huntzinger sisters, in the next couple of years. Bees Brothers caramels and various products can be purchased online—via http://www.beesbros.com/ or through email contact with Craig and Kami Huntzinger. Year round, Cache Valley’s Citrus and Sage is a local vendor of Bees Brothers products, and the actual “bees brothers” will be available at the Cache Valley Gardners’ Market through Oct. 13.